Find out first-hand how you can take advantage of the innovative ViaStone™ paper in your current printing and packaging solutions. ViaStone™ is the culmulative result of technology research over 12 years. 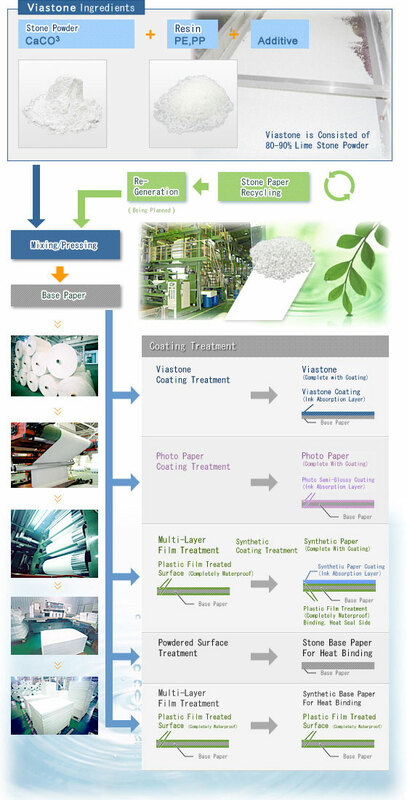 The process transforms inorganic mineral (pulverized power from limestone) and small amount of degradable resin into a paper that is functionally equivalent to the traditional pulp-based solution. ViaStone™ production does not require logging of trees, water for bleaching, or results in air pollution. It is a brand new way to make paper with the least impact on our precious environment. Copyright ©2008 ViaStone Corp., All Rights Reserved.